Main / My family is all gone! Well my mother passed away in July of 2004, my father in March of 2007 and my brother in October of 2008. I am the last of my family! My brother had two daughters, and I know they love me.....but they have their own lives to lead. My wife of 23 years has fallen into a deep depression and I can't get her to snap out of it. I have so many awesome friends, ones who would give me the shirt off their back, but I still feel so alone. I have two beautiful dogs, and a a nice place to live.....it just seems empty though. Main / Today was one of the hardest days I have had in awhile. My mother and father had purchased and RV to travel and see the world in 2003. The did make it to some places, but my mother diagnosed with stage 4 liver and lung cancer in April of 2004. She passed away in July of 2004. In August of 2004, we moved in with my father. Our house was damaged due to shady contractor. We stayed with my dad and looked after him. He continued to travel sometimes in the RV. He took my nieces to Graceland. He took some family to Colorado, and friends here and there. He would also take us Halloween Decoration sight seeing near Halloween. He became ill in late 2006, and was diagnosed with colon cancer right after the holidays. He had the colon surgery, but the stitches let go, and he did from becoming septic in March of 2007. He left quite a burden on us, as they still owed a great deal on the RV and house. Well my brother never could come to terms with my father's death. I took a great deal of the estate on my shoulders, and tried to sell, give stuff to proper folks, so forth. The RV was hurting us financial, but we still tried to take the family out every Halloween, and use it so it didn't just rust away. 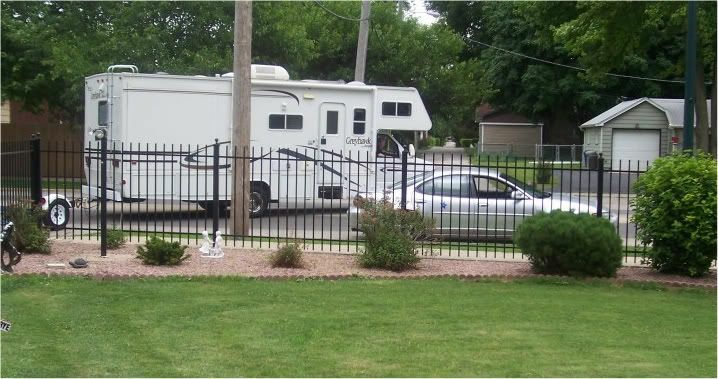 Well in late September of 2008, we had an offer to buy the RV, for a lot less than what we owed, but the RV was appraised less than what was owed.. Between my brother and I, if we split the burden, we could of been ok. We had things set to go, and evening my brother committed suicide. He left notes saying he couldn't cope with my father's death, and the fact that he had just been through a divorce. I felt lost, my whole family was gone. I had the burden of the whole estate on my shoulders. My Uncle, Aunt and wife were here to help..........but believe me it is a huge amount of stress. Well I am happy to say, that we sold the RV today. To a very lovely couple from Canada. They are going to be able to make new memories in the RV. We worked it with the bank were the burden was very easy on my to cover what was still needed, plus what they were paying. When they drove off in the RV, I asked them to please take a picture of my mom and dad on the day they bought the RV. If they could please put it somewhere in the RV, and that way.....when they travellled, it was like my mom and dad were getting to go to all the places they had wanted to also.. The gladly agreed. So the RV left today, with a new family, old memories.....and new ones to be made. Sibling Loss / Loss of my older brother. My brother passed away on October 17, 2008. He was only 44 years old! He has two beautiful daughters, who he was suppose to walk down the aisle. He also had played Santa for many, many years! He was suppose to be there to play Santa, when his daughters have kids. There was a lot of unsaid, and undone things between us. Our father had passed away in March of 2007, and my brother never got over it. He never got involved in the estate, and my Uncle and I had been handling most of it. I keep think there is something, I could have said, or even done......to prevent this tragedy.